During the summer of 2013, my husband and I went on a tour of Peru--Lima, Cusco, the Sacred Valley of the Inca, and Machu Picchu. It was the vacation we'd dreamed about all our lives! Our tour guide, Alex Vereau, made our tour the best it could've possibly been. Alex knew everything about the places we went, and he also told us stories about some of his "turistas." I knew, before the tour, that I'd want to write a novel set in Peru, but I never realized that the story for that novel would come from Alex! On the tour, we became good friends and we've stayed in touch through Facebook ever since. He graciously agreed to let me use his name in the book as the hero of the romance, and also to use the photograph I took of him at Machu Picchu on the cover of the book, along with the photo I took of Machu Picchu from the Watch Tower. Alex waited patiently for me to finish the book, which took much longer than he'd hoped! Finally, On April 22, I published KISS ME, LYNN as the second book in the Kiss Me Series of contemporary romances, begun in April 2013 with KISS ME, CHLOE. Alex will be the first to tell you that he once fell in love with a woman who was part of a tour group from the United States. That, of course, became the premise of KISS ME, LYNN. I fictionalized the story, combining several stories Alex told me on the tour with my own imagination, and the ending was a happy one, just as the ending of every romance is required to be happy. This book is dedicated to Alex Vereau, who is one of the kindest, sweetest people I've ever met. He does dozens of tours every year between April and October and would be thrilled to share his vast knowledge of the country he loves so much with new tour groups. You can find him on Facebook. Tell him Linda recommended him! On my website-- www.LindaGeorge.net --readers will find several blog posts with photographs taken during our incredible tour. 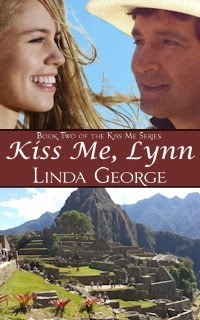 These photos were chosen because they're of placed toured in KISS ME, LYNN. You'll see photos from Lima, Cusco, the Sacred Valley, and Machu Picchu--the incredible city of the Inca built on a mountaintop by King Pachacutec--the only Inca city never found by the invading Spaniards. Sitting at the Watch Tower, gazing at the city below, was truly one of the most incredible experiences of my life. I hope you'll enjoy the photos of our tour as much as we enjoyed taking them! If you enjoy KISS ME, LYNN, I hope you'll check out some of my other novels for Kindle. KISS ME, CHLOE is my other contemporary romance. SILVER LADY and TOM'S ANGEL are historical romances. And ASK A SHADOW TO DANCE is a time travel romance set in Memphis, Tennessee. I'll be publishing two more books in 2014. I hope you'll watch for them!